Sonic the Hedgehog 3C Prototype 0517 for the Sega Mega Drive/Genesis was released by drx during the February 23rd, 2008 proto release. An earlier in-development beta with a compilation number of 0408 was also found. 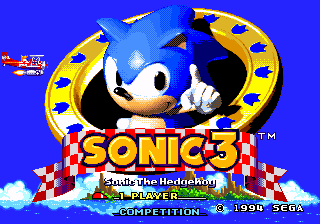 When this beta was obtained by drx the file was labeled 3C indicating this was an unreleased version of Sonic 3. Due to the late development date (dating after Sonic 3's release), it's obvious this isn't Sonic 3 before it was split into 2 games. This is a prototype for the canceled Sonic 3 and Sonic & Knuckles compilation called Sonic the Hedgehog 3 Limited Edition. Level Select: Enabled by default. Just scroll down on the title screen and select "Sound Test". Debug Mode: Debug is enabled by default. Just hold while selecting a level on the Level Select screen. The ring counter will be replaced with a player sprite/frame counter. All Chaos Emeralds: At the sound test screen, play songs 02, 04, 06, 08. Knuckles is a selectable character in 1-player mode. The save format is still the same as in Sonic 3. You can play a saved game past Launch Base Zone, but when you exit the game, the save will be indicated as "Clear", and only Zones 1 through 6 can be selected. If the game is beaten with the seven Chaos Emeralds, at the end of the staff credits, instead of the Sonic the Hedgehog 3 logo appearing, the "TRY AGAIN" screen with Robotnik and Knuckles will still appear, but Knuckles will juggle no Chaos Emeralds. When debug mode is active, the debug counters are always shown, unlike in Sonic 3C 0408 and Sonic 3 & Knuckles when they are only shown when in object placement mode. The timer displays the number of on-screen sprites, and the rings counter will display the ID number of the character's animation frame. Pressing while the game is paused returns you to the level select screen rather than the SEGA logo screen. All the explosions are black when debug mode is enabled. Monitor behavior is now like in Sonic & Knuckles where monitors can be destroyed from any side, even from underneath. On a Japanese system, the trademark symbols are not removed from the SEGA logo and title screen, and Tails' life counter does not become "Miles" even though the results tally changes to "Miles". The final credits medley is longer, different, and uses a few additional segments Sonic 3's zones. It also plays a more developed version of the victory music usually played after beating the Launch Base boss before going to the credits in Sonic 3. The music for the title screen, mini-bosses, Knuckles, invincibility, and collecting 1-UPs are all from Sonic 3. The Data Select music bug from Sonic 3 alone is still there. The Continue music is about 7% slower than it is in Sonic 3 and Sonic 3C 0408. In Sonic & Knuckles and Sonic 3 & Knuckles, it is about 11.2% slower than in S3. The music locations are ALMOST the same in Sonic 3 & Knuckles and this prototype; The only differences are that all of the songs (except the first occurrence of the Act 1 Boss theme) use the Sonic 3 versions, and that the original Sonic 3 credits located at $26 is replaced with the new Credits medley. The echo track of Flying Battery Zone's Act 1 music still goes off sync after two loops, and slowly gain drag behind the lead melody. In the sound test anything from D9 through FE has no sound. The final sound, FF, is the "Sega" sound. The "S" monitor makes the characters take their Hyper form as in Sonic 3 & Knuckles, rather than Super as in Sonic 3 final. For Super Sonic, he gets Hyper Sonic's rainbow palette and the dash attack, but doesn't get the star effect or the flash and sparks when the dash attack is performed. He doesn't get the ability to breathe underwater, either. Interestingly, Tails is able to achieve a Super form with only the Chaos Emeralds, but he doesn't get his Super Flickies or the trailing sparks. However, using an "S" monitor will give Super Tails the Flickies (perhaps there was a super and hyper version of Tails planned at one point). For Super Knuckles, he gets the ability to set off earthquakes by latching onto walls at high speed, but the trailing sparks aren't replaced with afterimages. He cannot breathe underwater, either. Hyper Sonic's stars around his body are completely different than in the final, and he has no afterimages. Unlike in final versions, if the "S" monitor is used with Knuckles, Hyper Knuckles WILL cause an earthquake when gliding for a distance into a wall. Act 1 will still play Act 2 music when returning from a Bonus Stage after the Zone has been set on fire, like in Sonic 3. In this Zone (and maybe every other zone), when the miniboss is finished and the signpost twirls down to the ground, if a power-up monitor shows up, sometimes it lands behind the sign post. In the final, if the monitor land around the same spot as the sign post, it's in front. One of the animation frames for the grabbable conveyor belts in Act 1 has somehow become corrupted in this build, showing garbled graphics. This would be fixed in the Sonic & Knuckles 0525 prototype. At the end of Act 1, you can die by drowning while it's tallying your score. The spring that sends you backwards at the beginning of Act 2 is replaced with a 1-Up, which is the same as Sonic 3 & Knuckles final but not Sonic 3 final. The Screw Mobile's twister can still glitch out Super/Hyper Sonic like it did in Sonic 3. The Act 1 miniboss crash glitch from Sonic 3 that can be achieved with a second player is still present. Knuckles' Act 2 boss doesn't play the "wall breaking" sound when the spikes penetrate the floor or ceiling. Knuckles does not run in at the start of Act 1. In Act 1, when Tails first comes down when playing as Sonic and Tails, the graphics are screwed up. The snowboard intro overwrites Tails' tiles with the snowboard's, and when the snowboard disappears, Tails' tiles should load. However, Tails' AI doesn't allow this to happen fast enough, and thus proceeds to draw Tails with some of the snowboard's tiles still remaining. Only when Tails lands does the tile swap complete and Tails return to normal. The floating icicle spheres in one of Knuckles' routes can still hurt you when in Super/Hyper form. As soon as Knuckles defeats one of the Twin Hammers, the normal Act 1 theme resumes while the other Twin Hammer is still alive. If you are Super/Hyper Knuckles, defeating one of the Twin Hammers will cause you to revert to normal and play the regular Act 1 music, as if both were defeated. In Act 2, the part between the boss on the level and the ones on the ship is not timed. The timer freezes upon entering the cutscene by stepping into the Eggmobile; it starts up again when you land on the ship. This behavior is exhibited by Sonic 3 & Knuckles, but not by Sonic 3 alone (the timer counts during the cutscene). Knuckles does not fight the Big Arm at the end of Act 2, and the boss music does not stop playing when the Capsule appears. Act 1 begins with Sonic and Tails falling from the sky in their standing poses, as was the case in the previous prototype. The first Giant Ring that Sonic and Tails can encounter in Act 1 now leads to Hidden Palace. However, if they have all the Chaos Emeralds, they will not warp to Hidden Palace and instead receive 50 rings. Strangely, the rest of the Giant Rings don't flash. Knuckles' first Giant Ring in Act 1 does not yet lead to Hidden Palace, meaning he has to backtrack to Sonic's first Giant Ring to go there. One of the giant rings in Mushroom Hill Zone isn't put in yet, instead it is filled with a diamond pattern of rings. The super ring before the transition to the Jet Mobile in Act 2 is still missing. The exit from the highest super ring in Act 2 is different. The Act 2 boss's starting position is shifted to the left slightly from the final. This allows you to score endless hits on the boss without destroying the satellite, and the battle won't start until you hit the satellite itself, thus it was changed in the final so the player cannot do this. Unlike in the 0408 build, the first 7 hits on the boss will count towards defeating it after destroying the satellite. The boss does not explode when killed until he crashes into the tree. After defeating Barrier Eggman, the floor begins to move up. In addition, there's a horizontal wall that moves right. Dying here not only garbles the clouds (as mentioned by someone else), it garbles the horizontal wall. Your character does not automatically roll when he busts down the door during the transition to Sandopolis Zone. He appears to be rolling in the Sandopolis intro, though. Your character enters Act 1 in a rolling state, but does not get stuck in the sand. The controls aren't even locked at all, meaning you are permitted to move left or right before you land. Tails seems to have quite a few collision problems. Knuckles doesn't run in at the start of Act 1. He just stands there, and there is a pile of rocks behind his starting position. Shields do not protect you from the debris of the Iwamodokis. The Heat Arms has a few messed up textures. Act 2's palette now changes to indicate a freeze-over when starting the Act from Act 1, albeit the lava cools more slowly. However, if the Act is accessed via the Level Select, the player dies or returns from a Bonus or Special Stage, the old palette will be loaded instead. When you encounter Knuckles, his theme doesn't play, and he laughs after punching the boulder at you. The boulder won't cancel your Super/Hyper form. The Act 2 boss area does not play the boss theme at the start. It plays it as soon as the boss emerges from the lava. The Act 2 boss area does not have a Lightning Shield. The ring pattern is also different. When you break the capsule at the end of the boss fight in Act 2, the platform on the screen floats towards the other platforms. You have to jump from platform to platform to get to Hidden Palace unlike in the final. This part is almost unchanged from the 0408 prototype except the transition to Hidden Palace does work. The player does not run in at the beginning. The music is still Sky Sanctuary's theme. A Fire Shield is provided in place of a Ring monitor before the fight with Knuckles. The secret monitor stash still has an "S" monitor and extra 1-Ups. Entering a Bonus Stage and coming back screws up the palette changes, causing areas to be purple when they shouldn't be (e.g. the teleporter and the Master Emerald's altar). It also allows Sonic to backtrack to Knuckles' entrance. The Knuckles fight still plays the Sonic 3 miniboss theme and continues to play through the Master Emerald theft scene after Knuckles is defeated. Various sound effects are still missing in the Knuckles fight and Master Emerald theft cutscene. Even though the controls are locked during the cutscene, Tails' controls aren't locked, and he will continue to use his AI if Controller 2 isn't used. The animation order for Knuckles punching the wall before the teleporter is different. He gestures for Sonic to follow after hitting the wall, instead of before. The HUD is still present (it's green while playing as Knuckles). Death Egg Act 2 music plays (this is due to it coming right after the Death Egg Final Boss level slot in the game). The intro plays every time you enter the chamber. The greyed-out Super Emerald locations don't save after you leave (They reappear after the intro). The laser zaps all the Super Emerald altars even if you already have that Emerald (Although it still shows that you have that Emerald). There is no Super Emerald screen after you beat a Special Stage. There are color differences in the prototype, probably changed so they could correspond with the colors of the Chaos Emeralds. The timer is not disabled, making it possible to get a Time Over. After the Metropolis Zone boss has been defeated, the balloons don't pop until they reach the ground. After defeating Mecha Sonic at the end of Sonic/Tails' Act, the results tally now appears, but Sonic and Tails won't do their victory poses and can still be controlled. Afterwards, the game cuts straight to Death Egg Zone without a cutscene. Knuckles' Act does not have any rings, and the teleporter is absent. When entering Act 2 with Sonic and Tails, Mecha Sonic has a glitch where there's an invisible wall in between the fighting area. When Mecha Sonic is defeated, the game acts like Act 1 was completed and doesn't continue to the next level. Also, when entering Act 2 with Sonic and Tails, Tails is able to jump behind the Floating Island sprite. Mecha Sonic is missing sound effects. The Doomsday Zone music does not play for Super Mecha Sonic. The final boss theme just continues instead. Mecha Sonic also freaks out when Tails is used. When Knuckles defeats Mecha Sonic, the appropriate ending plays according to whether Knuckles has all the Chaos Emeralds or not. However, there is no credits sequence, and Angel Island reaches the sea/stratosphere much more quickly. Afterwards, the game doesn't go anywhere, requiring you to pause and return to the Level Select. The overscan border color for Act 1 is red, instead of black like the other zones. The light beam transportation systems have a slightly different countdown tick. It's four low tones, instead of three low tones and one high tone. Red Eye's pillar no longer overlaps the player, but it still has tile transparency issues. Red Eye is somehow able to hit you and knock you out of your Super/Hyper form. This wasn't the case in Sonic 3C 0408. The palette changes too soon when transitioning to Act 2. In Sonic & Knuckles 0525 and later, the palette is changed after the Act 2 transition completes. Tails has an animation error during the Act 2 transition. The final boss music does not play. DEZ Act 2's theme just continues to play. After the final boss machine collapses completely, everything stops rumbling. If Death Egg's final boss is defeated while it's firing its laser, the laser stays on screen while it explodes. When Eggman/Eggrobo flies away, everything is much slower than the final, and if no buttons are pressed it is possible to get stuck in the bottom left unless Debug mode is activated. After defeating Eggman during the final chase, the HUD turns green. This is because the game has loaded Knuckles' 1P palette into the Knuckles CP palette slot. The Sonic 3 final credits roll after defeating the final boss, but an extended Sonic 3 & Knuckles medley is played. Also, the medley is longer than the credits, but the credits automatically restart to the Sega screen a few seconds after "Try Again" appears. Lots of rings are given at the start of The Doomsday Zone because there are none around when chasing Eggman. There are a lot more asteroids at the start and a lot more missiles before reaching Eggman. Various sound effects are missing. The background palette for The Doomsday Zone is the same as DEZ2's. During the first boss, if you move all the way to left, two missiles can actually be triggered from the end of the asteroid field segment. When you hit Eggman while chasing him, you don't get knocked back like you do in the final. There are no asteroids during the final chase. When The Doomsday Zone is cleared, the game goes back to the Level Select. While all three Bonus Stages are implemented and functional, you can access one randomly once you pass a Starpost with at least 50 rings. The color of the stars is always white. The Glowing Spheres Bonus Stage has a different layout and the items falling downward. The excess amount of objects causes the game to slow down at points. There's a chance you'll get a green ball with an F on it. It only makes the bumper sound the black ones make and has no other effect. Entering the Glowing Spheres level makes you lose all your rings. The score and timer are displayed in the Glowing Spheres Bonus Stage. This doesn't happen for the other two Bonus Stages. Entering this Bonus Stage makes you lose all your rings and your shield. The Slot Machine Bonus Stage has had its layout changed from Sonic 3C 0408, but is still very different from the final. The background in the Slot Machine Bonus Stage is still completely static. The little objects don't rotate and nothing scrolls. The first time entering Special Stage 2 on the Sound Test leads to a unused Super Emerald Stage. Essentially it's just a giant maze, which has no rings, although for some reason you don't get a Perfect. It gives you a Super Emerald like normal. A different Special stage is chosen each time you enter it. The Super Emerald Special Stages are the same as the ones in Sonic 3C 0408. Super Emeralds are still referred to as Chaos Emeralds. Collecting all the Chaos Emeralds as Knuckles does not display the "NOW KNUCKLES CAN BE SUPER KNUCKLES" message, though Knuckles can still become Super Knuckles. Collecting all the Chaos Emeralds after having sent at least one Emerald to Hidden Palace will not display the "x CAN GO TO HIDDEN PALACE" message.